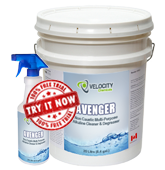 AVENGER is a light-duty all-purpose pine scented alkaline cleaner degreaser for high-pressure washing. It is effective for cleaning grease and oil from engine blocks, transmission housings, differentials and internal engine components. It is also an excellent floor cleaner. It cleans the exterior surfaces of locomotives, rail cars, trucks and truck frames. AVENGER is typically used in the heavy equipment, transportation, mining, forestry, pulp and paper, marine and railroad industries, as well as in engine repair shops. Pre-Soak – dilute to 4:1 or use full strength. Apply with low pressure up to 100 psi. Allow contact time of 2 to 10 minutes, depending on temperature and surface soil condition. Pressure Washing – concentration ratio varies from 1/2 oz. to 1-1/2 oz. per gallon (0.3-1.0%), depending on surface soil conditions and temperature. Floor and Equipment Cleaning – use from 20:1 to full strength, depending upon surface dirt and soil conditions. Rinse with water. At high concentrations, AVENGER may affect sensitive metals.